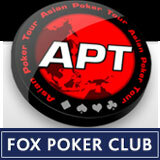 24 January 2011 (London, UK) -- The Asian Poker Tour (APT) has organized a £200 Turbo Tournament with a £4,000 guaranteed prize pool to be held tomorrow night, Tuesday 25th January, at the Fox Poker Club in London’s West End. Registrations will be capped at 40 entrants – more than 20 have already confirmed. This is a short format tournament starting at 10pm with the blind structure set for tournament completion at 2am. In addition to the prize pool, the APT will also donate £1,000 to the tournament winner’s UK registered charity of choice.